I've been wanting to see this movie since I first heard about it because I really like Sandra Bullock. I went to see the movie on opening day and I really like it. Sarah is a very up tight, by the book FBI agent who closes more cases than the men in her field office. She can be a little arrogant at times about her success at her job, which causes her co-workers to dislike her even more. Her boss says she isn't right for a promotion because of that and he sends her to Boston to work on a case involving a drug lord to prove herself. Sarah encounters Shannon, a detective on the Boston force, and things don't go well between them. Shannon is the complete opposite of Sarah, and she is a bit hostile most of the time. The women end up having to work together to catch the drug lord. The movie is funny and entertaining overall and I think it is worth watching. The story could be a little stronger, but that didn't bother me. The humor works well. Some of it does get a little vulgar or crude since it is an R rated comedy, but I don't think it is as bad as some of the other recent R rated comedies - including Bridesmaids. A little of that stuff is ok at times, but it gets old when movie makers just relie on that for the humor. Most of it isn't even funny. Thankfully, the funniest stuff isn't in the trailers. Some of it is a little silly or stupid, but it is funny and it works for the movie. Bullock and McCarthy are great together and both are very funny. They've shown in previous things that they aren't afraid to make themselves look silly for humor. There is action at times and some violence. Some of those things are a little graphic, but I don't think they are that extreme. 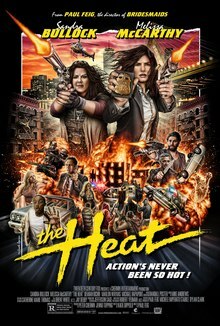 The Heat is very entertaining overall and it deserves to be seen, especially for people who like Sandra Bullock or Melissa McCarthy. I like Sandra Bullock, so this sounds interesting. I'll add it to my wishlist. I've been downsizing for years...the problem is my collection keeps increasing. I can't figure it out. Oh no...no one else has that issue. Nope. Not at all. What are you looking at? Move along..nothing to see...nope..no one here has a DVD/Blu-ray collection that is outgrowing the available shelf space. Nope. Not at all. Rewatching...? The total running time of the collection is so enormous at this point (mine, let alone yours) that it is very clear we can never really rewatch everything. I do occasionally rewatch things. Not too long ago I rewatched all my Harryhausen movies in chronological order from Mighty Joe Young to Clash of the Titans. Good stuff! But I'll have to admit that not very many of my DVDs ever get rewatched. I rewatch stuff..which is probably why I have so many still to watch. I just watched all of Castle..then Firefly and Serenity...The Mummy movies... and now I have started back with Harry Potter again. I'm up to watching the Ultimate editions of the first few 6 times now I think...never mind how many times I watched them on DVD before that... So yes, I do rewatch stuff frequently. I really like Harryhausen's stuff. Still want to get more but the ones I do have do/will rewatch. Yeah but when you rewatch, you at least know what you'll get. Watching new stuff always has an uncertainty factor. That is a very good point. I don't mind trying new movies...but I guess I'm just in the mood for certain things at times, and with movies I've seen before, I know which ones I think are really funny or fun or whatever.